8 out of 10 cats prefer Whiskies. Cat-nips in for a quick one. "I'm not paying. Put it on the tabby." "Before you lot start writing about me, I'm not feline thirsty, I'm not feline tipsy, I'm not feline drunk and I'm not feline anything else. I'm also not pawsing for thought, it's just the way I'm sitting. Now go and think up some new cat related captions." "Sorry, we don't allow meow meow in here..."
"Sorry, Mr. Whiskers. We don't serve catnip here." 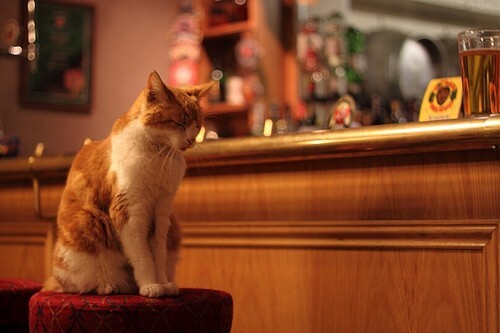 "Get that cat out of here ... it's just done a bar stool"
What time does the Lap Dancing start? "Better make it a quick one Betty, can't be sure what time Rover Returns"
Have you got anything for hard stools?